Three Rivers Mothers’ Milk Bank just announced it will change its name to Mid-Atlantic Mothers’ Milk Bank to better reflect the communities it currently serves. The Milk Bank partners with 20 Level 3 Neonatal Intensive Care Units (NICU) across the state, including all four of Pittsburgh’s Level 3 NICUs, to provide Pennsylvania babies in need with donated pasteurized breast milk. 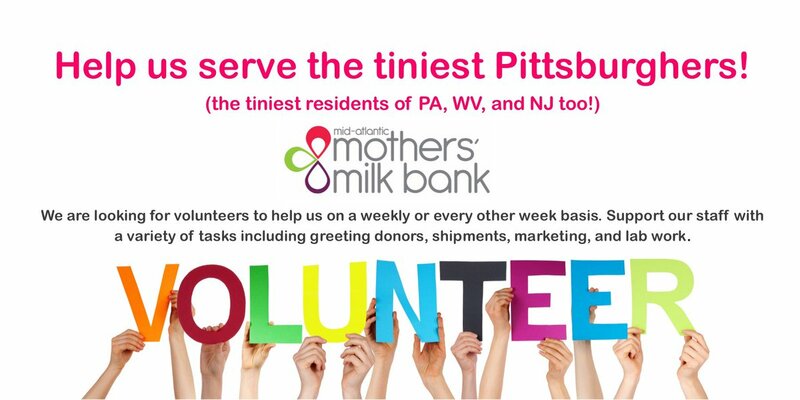 Since opening its doors in Pittsburgh in January 2016, the Mid-Atlantic Mothers’ Milk Bank has distributed more than 180,000 ounces of donated breast milk to 20 hospitals and numerous outpatients due to the generosity of nearly 550 donors throughout PA, WV, NJ and MD. “Pennsylvania is a giving community. The support we receive from our local foundations, moms, community members and partners allows us to meet the needs of our community and will enable us to continue to do so while saving more lives,” O’Connor added. To provide an additional convenient option to donors outside of the greater Pittsburgh area, Mid-Atlantic Mothers’ Milk Bank has begun opening donor breast milk depots. Two have opened so far – one at the Lehigh Valley Breastfeeding Center in Allentown, PA and the other at Excela Health in Irwin, PA. Approved donors may also ship milk directly to the milk bank. Kristen began donating her excess breast milk after her son Caleb was born. “I never realized there was such a need for this in our community. Being able to provide these fragile babies with milk has been a wonderful blessing, and I’m glad to see that even more moms and babies will have access to donated breast milk,” Kristen said. The milk bank hopes to continue working with its donors and foundations to make breast milk available for all mothers and babies—wherever they may need it. About Mid-Atlantic Mothers’ Milk Bank – Each year, 11% of the 140,000 babies born in Pennsylvania and West Virginia arrive prematurely. Babies receiving donated breast milk for necessary supplementation in the NICU have lower rates of serious infections and leave the hospital earlier than those supplemented with formula. Medically challenged outpatient infants also benefit from banked donor milk. When mothers’ own milk is unavailable, milk banks can provide pasteurized human milk from carefully screened volunteer donors. Non-profit Mid-Atlantic Mothers’ Milk Bank is accredited by and strictly follows the guidelines of the Human Milk Banking Association of North America. More information is available at midatlanticmilkbank.org.